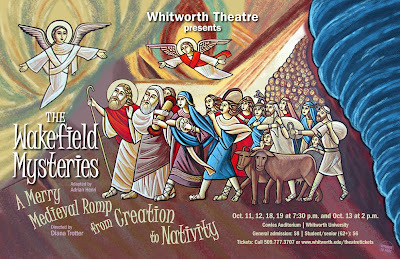 “The Wakefield Mysteries” is a series of medieval mystery plays based on stories from the Bible. The series’ original manuscript dates back to the mid-15th century and consists of 32 mystery plays written over the course of two centuries. It is the first medieval mystery production performed at Whitworth in the last 25 years. Trotter chose “The Wakefield Mysteries” as Whitworth’s fall production because of her love for medieval mysteries, and also because of the rich historical heritage of the plays. “They are true folk-plays, where the whole community was involved in producing and acting in them as a way of learning about and living out their faith,” Trotter says. “The plays had a wonderful ‘homemade’ quality to them in terms of the sets, props and magical effects.” Whitworth Theatre has maintained that same quality in its design choices, and freely mixes biblical and contemporary elements in the production. Ella Johnson, theatre department program assistant, Whitworth University, (509) 777-3707 or ejohnson@whitworth.edu.